The ruins of Gaines Mill near Mechanicsville, Virginia. The 22nd Massachusetts camped here for about a month during the Peninsular Campaign. The mill was functional then. If you’ve read this blog before, you probably know that I belong to a Civil War reenactor group that represents the 22nd Massachusetts Infantry, Company D. We are now in the midst of the 150th anniversary of the Civil War and so it has been a busy time over the past year participating in numerous events and ceremonies. And the busy times will continue over the next years. The 150th cycle has motivated me to delve into a variety of projects…at work, in reenacting, and with the Massachusetts Civil War Commission. I will probably discuss later some of the larger scale programs with the commission. But presently I wanted to highlight a modest research project that I am really enjoying. I’ve been reenacting with the 22nd Massachusetts for about 14 years and I think it safe to say that I’ve picked up a decent amount of historical knowledge regarding the actual unit. The 150th cycle has really inspired me, though, to better understand where the unit was and what they were doing on any given day. And I mean exactly where the unit was. It is almost like walking in their footsteps. 150 years ago, in the spring of 1862, the Army of the Potomac was struggling to capture Richmond during the Peninsular Campaign. It was led by Major General George B. McClellan, who made some poor decisions that would doom the campaign even in its early stages. With an army of more than 100,000 men, the largest force assembled on the continent up to that time, McClellan should have been able to rapidly advance on and perhaps even capture Richmond. Neither of these things happened…although Union troops did come within roughly 5 miles of the Confederate capital. I won’t get into the reasons for the failure of the campaign. But, in a word: Yorktown. Given the anniversary of the Peninsular Campaign, I thought it might be interesting to create a map (below) outlining the movements of the 22nd Massachusetts during their first campaign in the field. Using clues and place names from the regimental history, and aided by various period maps, I’ve been able, in a number of cases, to really pinpoint their location on a given day. Today, for instance, Monday, May 5, 1862, they were in camp at Wormley Creek outside of Yorktown. The previous day had seen quite a celebration. 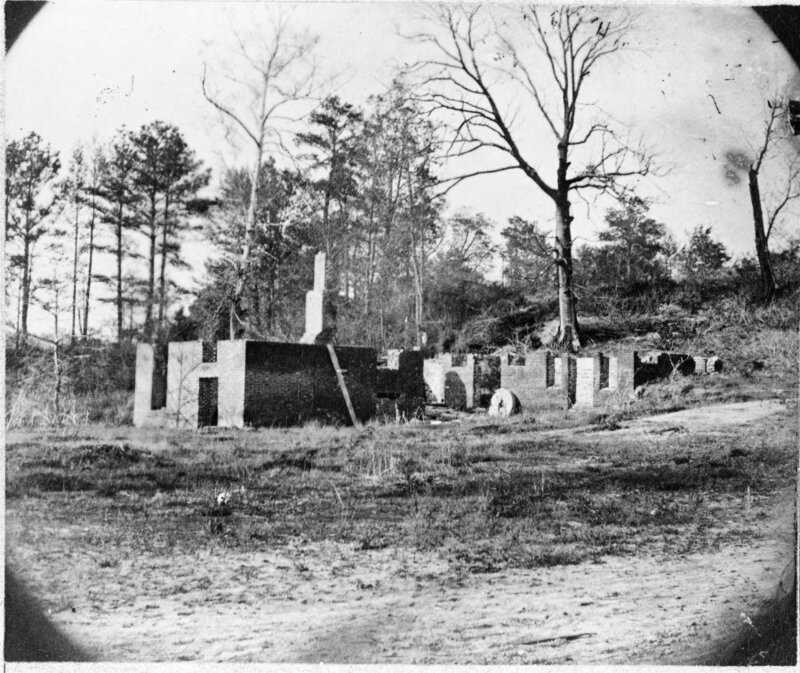 The Confederates, after enduring a month long siege, had abandoned the town. Deployed on picket duty in the trenches on May 4, the 22nd Massachusetts advanced to the Confederate ramparts and became the first federal unit to plant their national colors on the Confederate fortifications at Yorktown. That night there were torch light parades in camp and bands played for the first time in a month. On May 5, however, things were a bit more gloomy. It rained heavily. The 22nd marched through muddy roads to Yorktown and waited their turn to board a steamer which would take them up the York River. Their turn did not come that day and they bedded down in the rain-soaked streets. There have been some challenges during this project. First, this would be much easier if I were familiar with Virginia. I’ve never even laid eyes on the Peninsula (except from a plane). Some obscure place names have been difficult to locate. And, of course, names change over time, landmarks disappear. For instance, it took me a silly amount of time to figure out that the “Howard’s Creek” referred to in the regimental history is now Harwood’s Mill Reservoir. Most of the farmhouses mentioned in the history were destroyed by the war, but in many cases it’s been possible to figure out where they were. It’s been an interesting scavenger hunt, pinpointing such obscure things as the various military bridges that the army built over the Chickahominy. I realize this sort of minutiae is really only of interest to fairly hard-core Civil War buffs. That is to say, nerds, of which I am certainly one. The map is still a work in progress. I’m up to June 23, 1862, just about on the brink of the Seven Days Battles, which will be very interesting to plot out. I hope you check out the map below. Click on the various lines and markers for comments about their movements. It actually works better if you click on “view larger map” as the comments will then be visible in chronological order. I hope it is of some interest. At some point (probably not soon…but one day) I hope to actually retrace their movements in person.